Once the lesson container has been set up (see Add a Lesson) you can populate it with content and question pages. This is where the flowchart referred to in Plan a Lesson can be useful as you will need to think about links between pages. 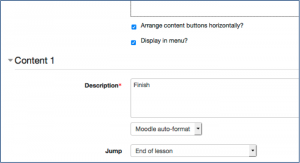 Turn editing on and click the lesson to start the page creation process. You will be asked how you want to proceed. In this guide we will look at question and content pages. For the other options see more information on lesson content types section at the bottom of this page. Select Add a question page to follow the example being used in the guide. 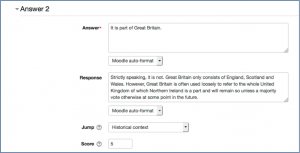 You are then prompted as to the type of question you would like to create from Essay, Matching, Multichoice (default), Numerical, Short answer or True/false. 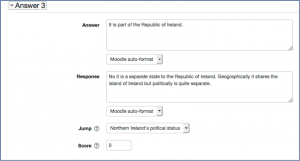 See Question types on Moodle Docs for more information for more information. Accept the default Multichoice and click Add a question page. 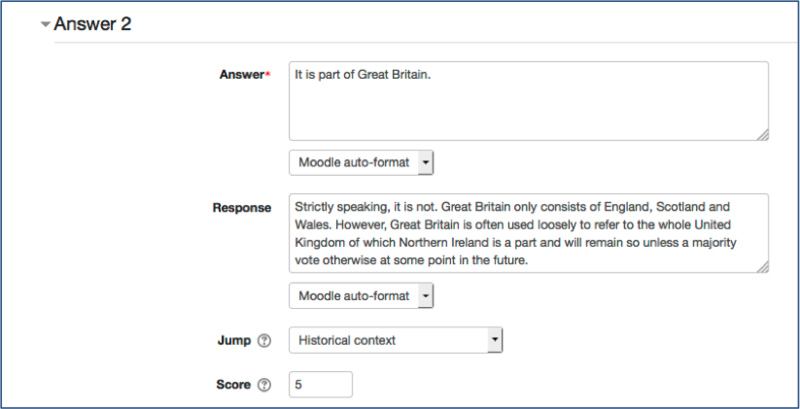 Give the page a title, which you may also want to repeat in Page contents as the title of a question page is not displayed to students. You can also add a picture if you wish. Then type the question text. 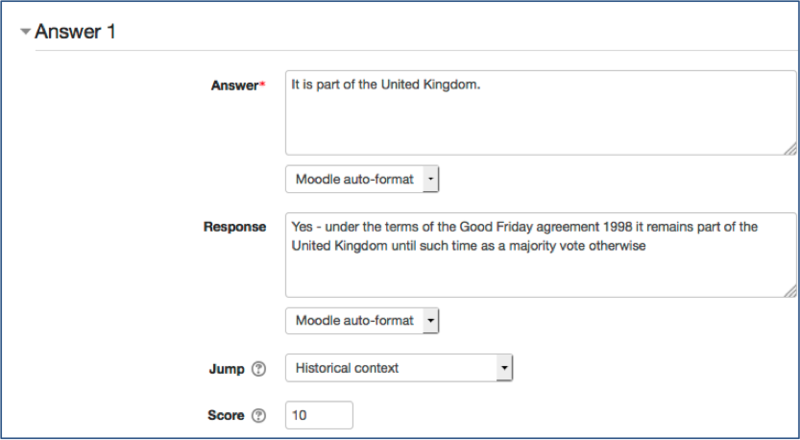 This example is a single correct answer, so Multiple-answer is unchecked. Click Save page to complete the page. Take the question and make sure it performs as expected. 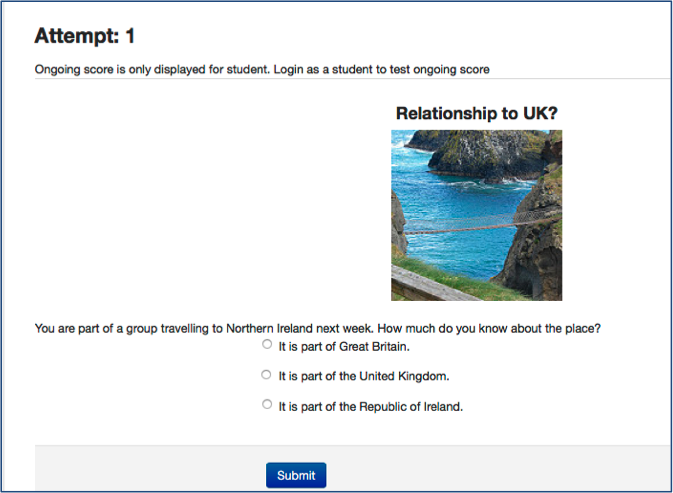 You may want to Switch role to student to test scoring. 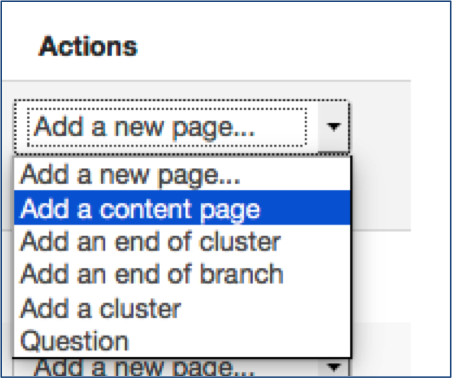 To create a new page, return to the Edit tab and click the drop-down on Add a new page on the far right. Select Add a content page this time. 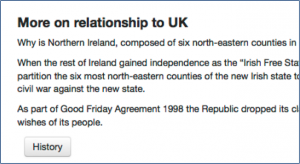 Start by adding the Page title and contents. 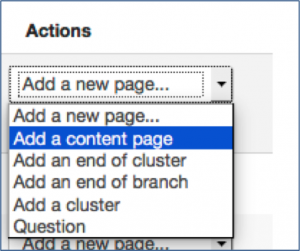 Then use Content 1, 2 …. to provide alternative routes from this page to other content. (Unlike question pages where the student’s route is determined by answering a question, on content pages students make choices as to where to go next.) 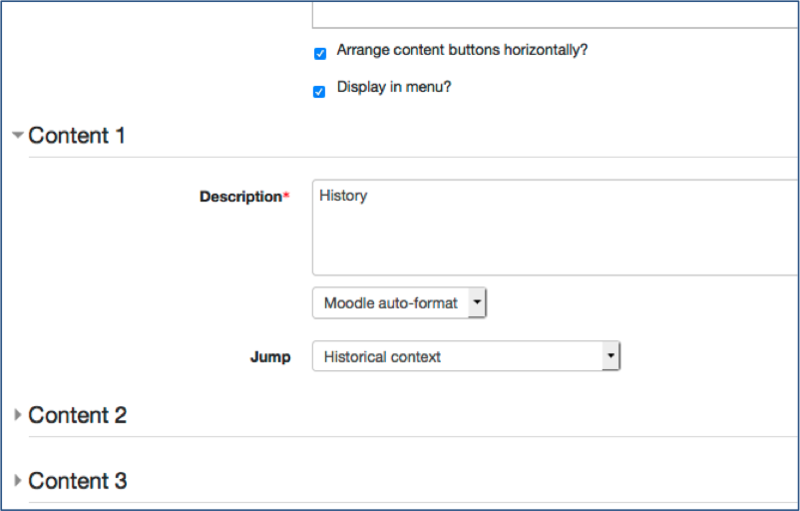 In this example there is a single route at this point, so we have added History as the text to appear on the content button. We have also added Jump information to the relevant page. 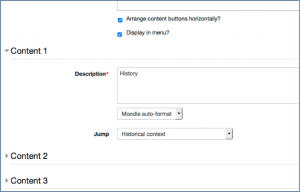 See Add a content page on Moodle Docs for more information. Then Save page to go back to the Edit. You can then Preview the page. 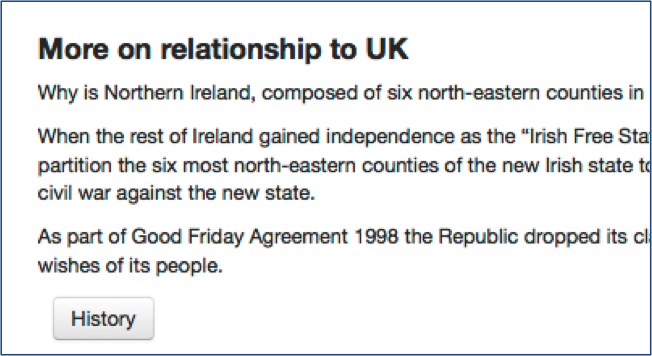 Note how the content button ‘History’ appears. 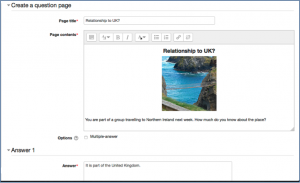 Continue creating content and question pages as required. When you get to the final page(s), select End of lesson as the jump. 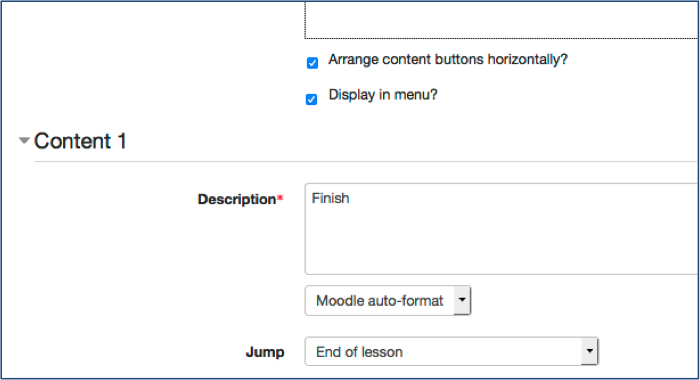 To make changes to the lesson at any time, Turn editing on and click the lesson, then use Add new page to add a new page (see above) or use to edit an existing page. You can also move and delete pages. To take the lesson as a student, use Switch role to student. This is the only way you will see how scoring works. 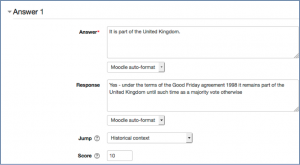 It is possible to import questions as well as create them from scratch. 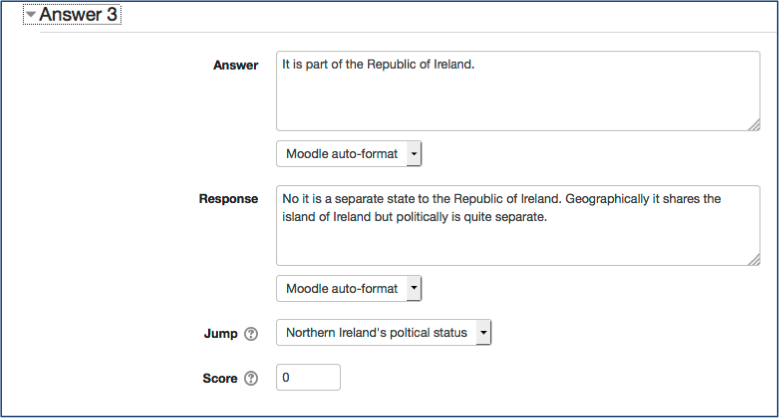 See Import questions on Moodle Docs for more on importing options, including questions that already exist in the Moodle quiz Question bank. 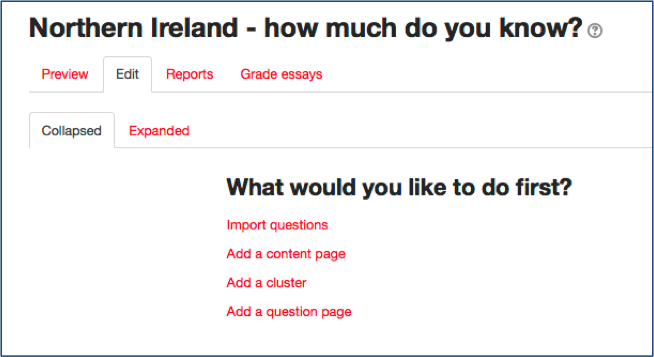 Clusters are banks of question pages that can be delivered randomly to students. 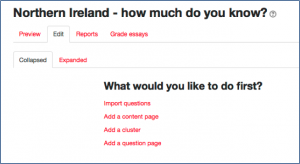 See Add a cluster on Moodle Docs for more information.